There’s a major factor that can make or break your company, and that’s whether or not you have a strong brand identity. This doesn’t just mean having a professionally-crafted logo and a signature color palette, although these elements are important. The brand identity of a successful company relies on a singular vision for the future direction of the organization. It means having a clear, honest grasp on who the client is and what services the company will provide for them. In a way, a good brand identity can make a company appear “larger than life,” creating a mystique of sorts that serves to drive relationships with clients and partners. 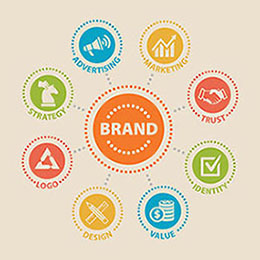 How do you develop a strong brand identity? We’ve compiled this list of four components to include in your brand development strategy. Think about the values that your organization holds dear. Can an observer tell what they are just from watching your messaging alone? Your brand should fully embody your organization’s inner essence. It should speak clearly with the voice of the company, focusing like a laser on your target audience to communicate who your brand is and why it’s worth it to them to develop a relationship with you. The better you are able to do this, the less unfocused your audience will be – making it easier to effectively market to them. Think of a sophisticated engine. Can you draw it without looking at one? Few people can, even if they’re artists. The shape of an engine is just too complex to keep clearly in the mind. Contrast that with a triangle; it’s quite easy to draw one of those. Children do it every day. The lesson here is that simple concepts are easier for us to remember than more complex ones. It’s also easier to communicate simple concepts to others. When you can get an observer to remember your brand identity, they’ll be better situated to remember your brand when the time is right. There will also be a stronger chance that they’ll spread the knowledge of your company and its services or products to other interested parties. In fields with many competitors, buyers can have a difficult time making their final choice. Time and time again, what ends up happening is that the brand that stands out is the one that gets chosen. What’s the best way for your company to stand out? One way is to cultivate a brand image that your audience won’t see anywhere else. This could mean using a palette that the observer wouldn’t expect or addressing a target market that is historically underserved by your industry peers. There are many ways that you can approach this concept. While it can be tricky at times, the rewards of standing out are well worth the risks. Timelessness means avoiding fads that occur within your industry. Fads are trends that explode in popularity and then catastrophically decline over time. Are you able to date a competitor’s logo to the year or decade based on certain visual elements that it contains? That’s a sign that they were unable to resist the siren call of whatever fad was popular at the time. Don’t let this happen to your brand. Think long and hard about whether your font choices, logo, palette or targeted personas would have been relevant a decade ago and still will be relevant a decade from now. That’s a great sign that your branding decisions won’t soon be out of fashion. If you’re ready to transform your brand, contact the experts at GrowthMode Marketing. We’ve helped countless companies define and refine their brand identities.